I bought some skeins of Paca Tweed, by Plymouth Yarn, one year ago. 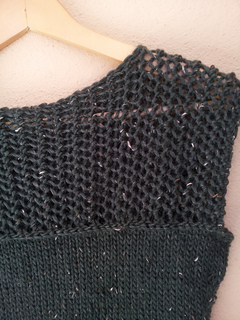 Since then, I have been thinking what to knit with it. It is an extremely soft yarn, but relatively thick and only one ply. 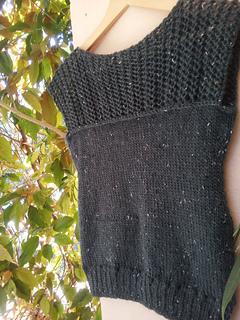 It is a delicate yarn and deserves a delicate pattern. I thought that a top with a lace would be perfect for it. 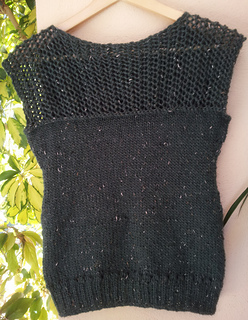 This top is a heavily changed version of Cap Sleeve Lattice Top, Purl Soho pattern. I love this design but I made some changes to adapt it to my likes and avoid the dislikes. It is work in round, with side decreases and increases in the waist to better flatten and finished with a three needle seam instead of grafting. I also changed the open lace in the upper part. This design is easy to customize. You can knit it longer or shorter. 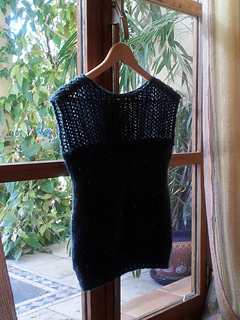 You can wear it with the seam front or back or, if you prefer, you can knit it with the seam inwards. It is also a good project to practice new lace patterns. Just add imagination. It is evident from the photos where the name comes from. 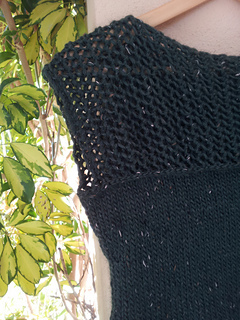 The color of the yarn reminds me a Deep Green Forest. Even the tweed fits perfectly.